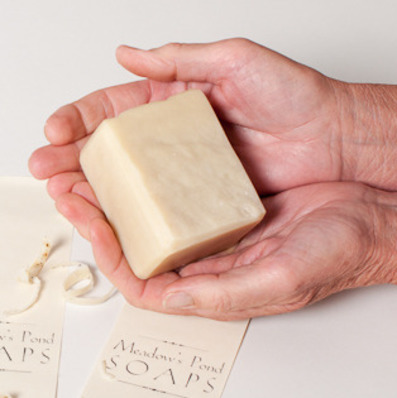 Soap, handmade by Janet King. Made with local lard, Lemon, Patchouli Pear, Pine Tar. $1.50/ounce. Helps with healing after cuts or poison ivy and soothes disorders such as dandruff, eczema, and psoriasis. 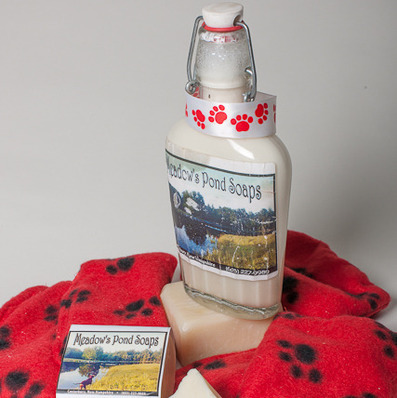 Created for dogs using citronella, lavender and other essential oils for coat and skin health, and keeping bugs away. Freshly made in small batches, using organic oils, bees wax and essential oils. 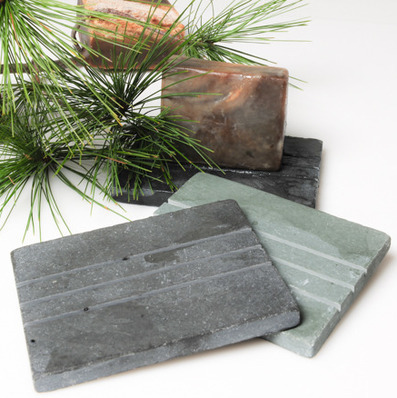 Hand cut stone by Ardosia Stone in Montana, using Brazilian Stone. 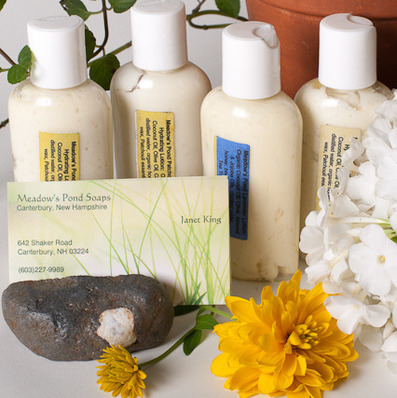 Local (when available), high quality ingredients are used when making our soaps, lotions and lip balms. 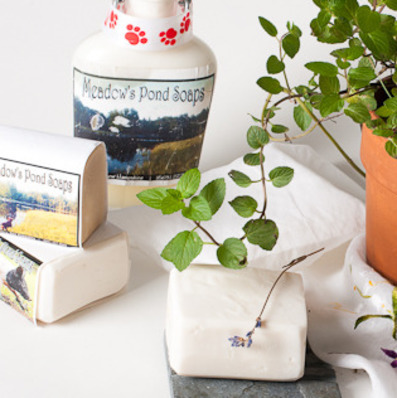 The animal products, beeswax, honey, herbs and flowers used in our products are from nearby farms. 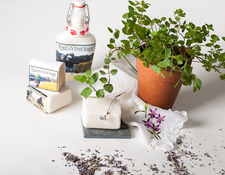 Our products are created the old fashioned way, using basic, natural and organic ingredients such as organic coconut oil, organic jojoba oil, grapeseed oil, organic olive oil, organic jojoba oil, organic cocoa butter, vegetable shortening, beef or sheep tallow, lard, Vitamin E, honey, beeswax, goat's milk, pine tar, oatmeal, essential oils, fruits, plants and flowers, such as lavender, lemon balm, jewell weed, spearmint, and peppermint. Click here to contact me by email. 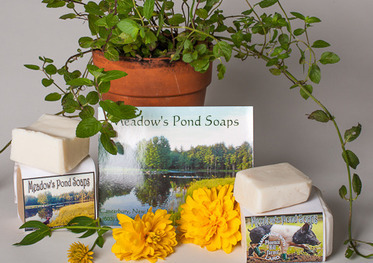 Click here to see the Meadow's Pond Soap Facebook page. Or fill-in the boxes below to send me a message. Aniseed: Smells delicious to licorice lovers. Baby Bastille: Made with organic olive oil and carrots for sensitive skin. Calendula: Calendula has a history as a wound-healing and skin-soothing botanical. Carrot: Carrot oil is known to improve skin tone, elasticity and health. Coffee: Contains Granite Ledge Coffee. Exfoliating, removes odors from hands. Gardener: Contains sand and organic oatmeal to scrub off dirt. Lavender: Made with local lavender. Oatmeal: Oatmeal has exfoliating properties, and can helps reduce pore size. Pine Tar: Used for years to help with a variety of skin issues. Patchouli: Hippie scent and known to heal dry and itching skin. Rose Hip: Rose hips are loaded with vitamin C and their astringent quality keeps your skin elastic. Three Tree: Made with cedarwood and tea tree essential oils and pine tar. Healing and vegetarian. Woodsmen: Contains citronella and lavender to keep bugs away. Ylang ylang: 100% vegan. Ylang ylang conjures hope, is invigorating and rejuvenating. Shampoo: Very concentrated, also chemical-free. Bug Off: An insect repellent made with many organic ingredients. "You can never be clean enough. It's a dirty world." Also from Saturday's Soap: "We are changing the landscape of everyone's skin one person at a time." 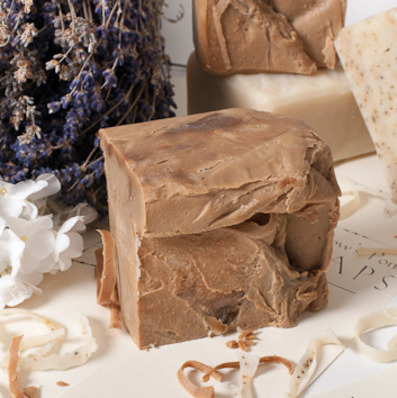 Soap making class locations are posted on Facebook. You can also host one at your location. 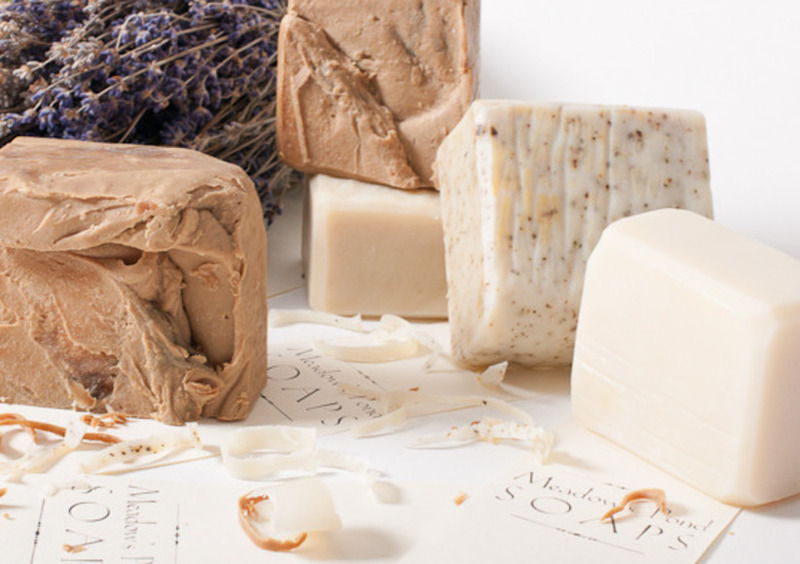 My soap varieties change with the availability of ingredients. 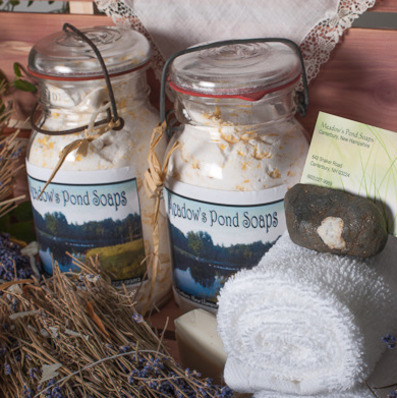 I make soap in our “green”, off the grid home in the woods, using the wood stove in the winter. When a neighbor calls and offers her calendula and chamomile flowers, it's time to make calendula-chamomile soap. When another says, “Come and get some rose hips before the birds eat all of them”, it's time to pick their rose hips and infuse them in oil for future rose hip soap. 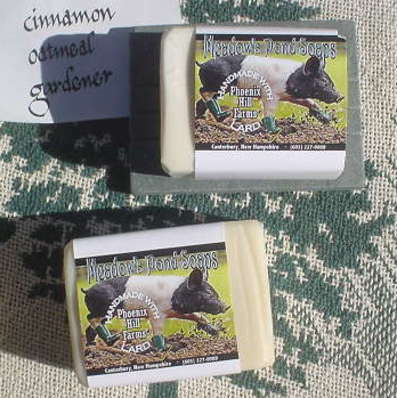 And, when a pig farmer lets me know they are getting ready to process their pigs, I say, “Yes, save me the fat.” Many people in Canterbury have products to offer for use in my soaps and I'm always happy to add more varieties to my list. Unfortunately, there are some varieties that are limited editions or I am out of because of farmers' choices. 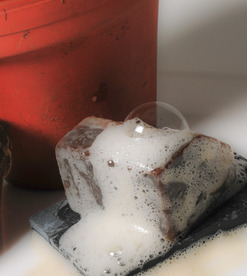 For example, I was able to make some beautiful sheep tallow soap but the farmer decided to discontinue raising sheep. Therefore, no more Ewe Eucalyptus soap. 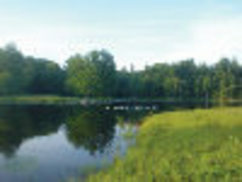 Unfortunately, another local farmer decided to end their farming ventures altogether. So, enjoy the soaps while they are available. And give me your ideas, too.